As a parent, you need to save money and spend it wisely, in order to get more book for your buck. It's far from easy, as every parent knows. Throughout my read aloud career, I've also been trying to keep picture book expenses under control. To keep in tune with my readers, I review only what I buy. No free books from publishers for Read Aloud Dad - not that there is anything wrong with getting sample books for an honest review, mind you. I've got a treasure tip for you. Take a look at these two incredible anthologies. They are a steal !! Parents usually don't get an opportunity to save money on children's books - ever. With such a wide range of authors and picture books for young listeners - saving money is exactly what you can hope for with this pair! Take your pick. I did. ﻿﻿The good news is that whichever treasury you choose ... you win. In the case of this pair, I agonized because I wanted both. I was a click or two away from ordering some of the 58 smashing children's picture books offered in the form of two separate books. I couldn't make up my mind which treasury to buy! 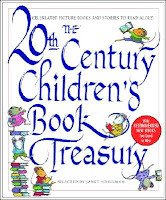 Should I take the The 20th-Century Children's Book Treasury: Picture Books and Stories to Read Aloud (with its massive 46 children's books and excerpts) although it did not carry all the illustrations from the original books and the ones included were often reduced in size? 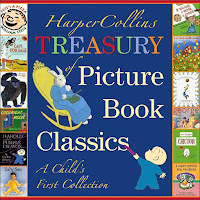 HarperCollins Treasury of Picture Book Classics: A Child's First Collection? In the end - I took the plunge and ordered BOTH (in January 2010, one year ago). Brace yourself - I'm ready to spill the beans on both of my purchases. Before I go into the details - let me tell you the most important thing. I forgot to include this book in my "5 ways to find the best read-aloud books". This treasury almost deserves a place of its own. I can't review here all the 46 picture books, due to its sheer size, what I want to do is to share my thoughts on the treasury. This anthology is a hot bed of ideas for a new read-aloud parent, it will help you discover new authors and new illustrators - it's richness and breadth is simply infectious. Instead of making costly mistakes (buying books your kids will not like), the treasury will allow you to identify what your kids love ... and then you can build on this. This treasury introduced my twins and me to Robert McCloskey's Make Way for Ducklings - it resonated with all of us. Since then we ordered ALL (yes all!) of McCloskey's books as stand-alone edictions. Oh yes - and Harry the Dirty Dog! After he charmed my daughter, I decided to look for Harry's own treasury of stories to keep the love affair between my kids and Harry going. This 20-th Century Treasury is not a mere collection of children's books - it is a wealth of ideas for parents who wish to expand their knowledge of children's books. Keep in mind though that some of the illustrations have been omitted in this anthology, while others have been reduced in size. Still, it is an incredible feat. With two exceptions (Amelia Bedelia and Petunia, which were slighly abridged), all selections include the entire original text. Although a year has passed, we still have not read all the stories in this Treasury. It is so comprehensive. There are stories for different age levels - which is a fantastic concept. Selector Janet Schulman even included color-coded symbols with each story in order to indicate the approximate age level. symbol) and which require a greater attention span or range of experience. To say that the list of picture books included in this treasury is extensive - is an understatement. And the pictures in this anthology are huge! You are sure to win over any toddler. It's sheer size does not prevent my small daughter from hauling this book around wherever she goes. I still can't believe that she can carry and "read it" on her own, but she never complains. For small children, this book may be the more approachable of the two treasuries - because as a read-aloud it is geared primarily to the younger ages. This treasury will also have great value as a source of reading material for kids when learning to read - so it will be useful later on as well. important to my twins that there was a period when we had to read it practically every day for almost a month and I ordered the other books by the same author (Laura Joffe Numeroff) - such as If You Give a Pig a Pancake, If You Give a Moose a Muffin, etc.). Two-year olds and three-year olds need a lot of visual stimulus - and here lies the success of this treasury. It has 12 unabridged picture books with full-size illustrations. Comparing them I can only conclude that these anthologies are complementary - not rivals. I see the HarperCollins Treasury of Picture Book Classics as the best option for youngest listeners (because of its fantastic visuals with full color illustrations), while the 20th-Century Children's Book Treasury has four times as many stories and a greater potential to satisfy kids of different ages, despite sacrificing a significant number of illustrations (in terms of number and size). These two anthologies do not compete in my household - both are equally loved and enjoyed. If you are wondering, there is no overlap between the two - except for Goodnight Moon. Looking back, I can say that The HarperCollins Treasury of Picture Book Classics helped my twins to get hooked on picture books, while the 20th-Century Children's Book Treasury helped them get hooked on read alouds. Sounds similar, but they achieved different things. So both books were instrumental in their development. Buy a treasury, save money and shower your kids with new picture books and read-aloud material. A win-win solution for any read-aloud family!